Mike Saliba is hoping his talents on both sides of the ball lead Xaverian back to the top. If you are looking for parity across the Massachusetts High School Football landscape over the last half decade, the Div. 1 South Sectionals have been the last place to go searching. Since the implementation of the new playoff format in 2013, Xaverian has won five consecutive Division 1 South titles, including a pair of Super Bowls in 2014 and 2015. While the Hawks have been no slouch on the offensive side of the ball over the years, there has been no greater lynchpin to their success than their nearly impenetrable defense. Over the course of the last five seasons eventual household names have pioneered the unit, including current Northwestern standout Joe Gaziano, Yale Bulldogs in John Dean, Brian Abraham, and AJ Ryan, Bryant defensive back Mekhi Henderson, and Brown’s Cal Flanders. Now, using the tools he learned from those before him, another Xaverian linebacker is trying to carve out his own niche in that special class. 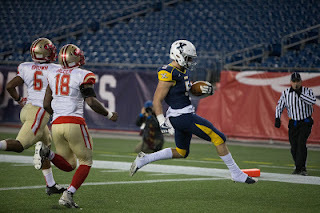 Saliba grew up in Dedham, beginning his football career at Memorial Field at the age of seven. Baseball and basketball never overly appealed to him. The pace of football too enticing. He played pop warner and attended Saint Joseph’s in Needham. Almost immediately, Saliba was introduced to the possibility of taking the catholic school route. Saliba visited a variety of private schools, most notably Boston College High School and Catholic Memorial before ultimately settling on being a Hawk for his four-year high school career. He was a member of the freshman team his first year in school and watched from afar as the Hawks – led by the likes of Ryan, Dean, and Henderson – claimed the Division 1 crown. Saliba came in his sophomore year and earned the opportunity to be a member of the varsity team in what ended up being Charlie Stevenson’s final season at the helm. The road to, and defeat, in the Super Bowl remains in Saliba's memory, but what sticks with him most is the tutelage that he underwent while playing alongside Ryan and fellow senior outside linebacker Colin Lama. "Mike and I played the same position and he was just like me, so I tried him become a better player and teach him everything I could," said Lama. "We are still good friends, and I try to reach out to him and help with anything he needs." While Saliba did not play a heavy share of the snaps during that 2016 season, the lessons have proven to be invaluable. With most of the 2016 core gone, Saliba began handling the reigns last year with former Hawks’ defensive coordinator Al Fornaro taking over as head coach. Saliba established himself as a versatile outside linebacker while also helping out of the backfield behind starting running back Ike Irabor. Alongside fellow linebacker Michael Masse the Hawks once again put together one of the state's premiere defenses. Saliba finished with over 70 tackles, an interception, a fumble recovery, and a forced fumble as Xaverian claimed the Div. 1 South title. What matters the most to Saliba is that he contributes on both sides of the football. In 2017, playing behind Irabor, he totaled seven touchdowns. While Saliba came into high school as a dual sport athlete in football and lacrosse, he dropped the latter after his freshman year and chose to focus on conditioning in the offseason. He spends the winter and spring running track, doing weight training, and building back up his stamina for when the summer months roll around. Now a captain, the six-foot-one, 215-pound Saliba is focused on leading Xaverian back to the top in Division 1. The Hawks have fallen to Everett in consecutive Super Bowls, something that is fairly unfamiliar to the school on Clapboard Street. He has yet to settle on a destination for the next four years, hoping that his play this fall will interest local schools that have become pipelines for some of the Catholic Conference's most notable stars. The dynamic linebacker duo of Saliba and Masse, alongside star defensive back Cooper DeVeau, are at it again to begin this season. They have helped lead Xaverian to a 2-1 start. Most recently, Saliba is coming off a performance this past Saturday in which he rushed for 109 yards and a touchdown as the Hawks knocked off New York powerhouse Archbishop Stepinac. Saliba will get his chance to prove over the next couple of weeks that he is the most valuable player in the Catholic Conference. Xaverian will take a trip to Catholic Memorial on Friday and wraps up the regular season in week seven with BC High. Most importantly for Salbia, those games represent opportunities for Xaverian to show everyone in Massachusetts what the Hawks are all about.